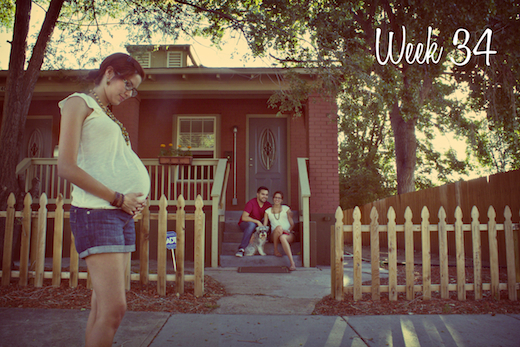 We've made it to week 34 and I'm feeling...well, I'm feeling a roller coaster of emotions! Most of the time I am just so excited, sometimes I'm gripped by fear or anxiety. Alex is a champ of a husband and deals with me in the best way possible. I had another midwife appointment this week and everything is just perfect with Liam. At this point I've gained 30 pounds, eek! My midwife says my weight gain is perfect but I can't help but feel freaked out by that number. My next appointment is at 36 weeks and then I'll be going every week after that...crazy! The day when Liam makes his appearance into the world is getting closer and closer. For this week's picture we would like to welcome you to our home just off of 34th Ave. It's a cozy little duplex that we love. We purchased this home in December and moved into it in January. I feel so blessed to live here. Decorating our first home has been so much fun. It's constantly evolving as we come up with new ideas and make room for baby. Feel free to stop on by to pay a visit to the Acevedo family.